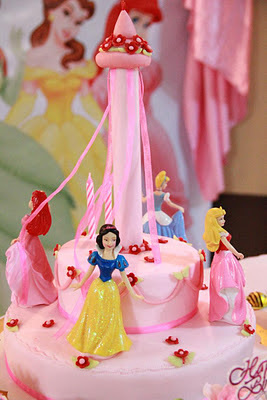 It's a Disney Princess themed birthday cake for a 2 years old girl. Her aunt, Deva ordered the cake for her. The design idea was entirely provided by the aunt. She even bought the porcelain princess figurines to be put on the cake. Apparently, the birthday party theme is princess. Deva wanted everything to be in pink as well. She even made their guests wearing pink, hahah, it's a favourite colour of Mom And Daughter Cakes too! The biggest challenge of the cake is the pole in the middle. What should I do with it? I was quite puzzled initially. Should I use cake pillar, bamboo stick or PVC pipe? How should I cut it? Should I wrap it with fondant or royal icing? So many question marks popped up on my mind because of a single pole, hahah! Luckily, everything just came into place at last. Thanks a lot for the Princess Cake. It was Awesome. Everyone loves the cake and the design as well. I really really love it. 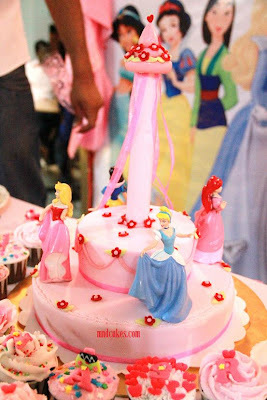 The cake went well with the theme i had..Princess. Thank you too, Deva for trusting us.